The Metrobank Group and GT Capital Holdings, Inc., through the Metrobank Foundation, Inc. (MBFI) and GT Foundation, Inc. (GTFI), celebrated the Chinese New Year through the 2018 Bags of Blessing project which kicked off on February 16, 2018 at Lancaster New City Activity Center in Imus City, Cavite. Through a P 10 million worth of donations, 10,000 families from 21 cities and municipalities nationwide will receive P 1,000 worth of food bags. Photo shows Metrobank Group founder and chairman Dr. George S.K. Ty (6th from left) leading the ceremonial turnover of goods to beneficiaries. He was joined by Department of Social Welfare and Development (DSWD) officer-in-charge Emmanuel Leyco (7th from left); Metrobank Foundation adviser Mary Ty (5th from left); Metrobank chairman Arthur Ty (5th from right); Federal Land chairman Alfred Ty (3rd from left); Metrobank Card Corporation vice chairman Anjanette Dy Buncio (2nd from left); GT Capital Holdings assistant treasurer Alesandra Ty (2nd from right); MBFI president Aniceto Sobrepeña (leftmost), and PRO-FRIENDS president Guillermo Choa (rightmost). On the day of Chinese New Year, the Metrobank Group and GT Capital Holdings, Inc. kicked off the Bags of Blessing project last February 16, 2018 at Lancaster New City in Imus, Cavite. Spearheaded by the Ty family foundation—GT Foundation, Inc. (GTFI), together with Metrobank Foundation, Inc. (MBFI), PhP 10 million worth of food packages will be distributed to 10,000 families in 21 cities and municipalities nationwide. For this site, a total of 500 underprivileged families from General Trias, Cavite were assisted, held in partnership with the Property Company of Friends, Inc. (PRO-FRIENDS). 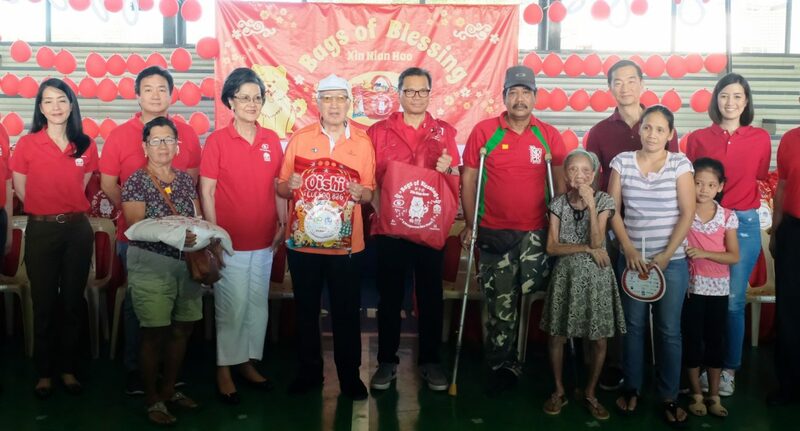 A brainchild of Metrobank Group founder and chairman Dr. George S.K Ty, Bags of Blessing is a series of gift-giving activities in select areas nationwide catering to underprivileged families. Instead of the traditional “ang-paos” (red envelopes containing cash), each family receives a bag containing PhP 1,000 worth of food items. Beneficiaries were carefully selected from the National Household Targeting System for Poverty Reduction (NHTS-PR), known as “Listahanan”, of the Department of Social Welfare and Development (DSWD)—an information management system designed to provide a comprehensive database of the country’s poorest families in need of assistance. A number of families identified in cooperation with the Catholic Bishops’ Conference of the Philippines (CBCP) are also included in the beneficiary list. Other than belonging to the status of living below the poverty line, families affected by recent calamities, Indigenous Peoples (IPs), and non- 4Ps beneficiaries are given priority. The distribution was led by Dr. Ty, who was joined by DSWD OIC secretary Emmanuel Leyco; Metrobank chairman Arthur Ty; Federal Land chairman Alfred Ty; Metrobank Card Corporation vice chairman Anjanette Dy Buncio; GT Capital Holdings assistant treasurer Alesandra Ty; MBFI adviser Mary Ty; GT Capital Holdings president Carmelo Bautista; Philippine Savings Bank president Vicente Cuna; PRO-FRIENDS president Guillermo Choa; First Metro Asset Management president Augusto Cosio; Orix Metro Leasing and Finance Corporation director Fumihiko Sato; and MBFI president and GTFI executive director Aniceto Sobrepeña. The Armed Forces of the Philippines (AFP) and the Philippine National Police (PNP), in coordination with concerned local government units and Catholic archdioceses also serve as key partners in this undertaking. Simultaneous distributions will also be held in the following countryside areas, with 400 to 500 beneficiary families each—Sta. Rosa City, Laguna; Baras, Rizal; Infanta, Quezon; Botolan, Zambales; Iloilo City; Cebu City; Naval, Biliran; Ormoc City; Davao City; Surigao City; General Santos City; and Talacogon, Agusan del Sur. Selected sites from the National Capital Region (NCR) include the City of Manila, Taguig City, Pasay City, Marikina City, Quezon City, Makati City, Navotas City, and Caloocan City.